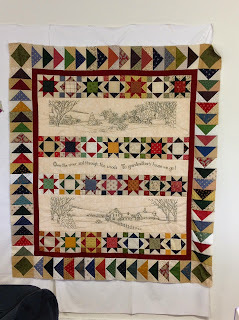 Quilting and Life in General: Back by popular demand ... Year in Review! Back by popular demand ... Year in Review! Ok, I'm probably the only one wanting it! But somehow the New Year doesn't seem started until I summarize the last year! This year, I'm really,really late doing this. So, best get on with it! Projects I made and loved. Not necessarily both on the same project! Just ask DH - sometimes he thinks I've turned into a teamster! The language!! Over the River ... the Scenic Route. This adorable Crabapple Hill pattern was a joy to make with a friend. Until I moved and had finished my part of "her version" but hadn't started on my own! Then it drug on and on and on ... Here it is on the design wall. But it's Finished at last! And I like it again! Read more about it here. Brookings guild had a Nautical Challenge. Oh, I've got no time for that, until I was sifting and sorting thru books and found one that had a Nautical Theme and there were several patterns there that attracted me ... I found I did have time after all! Story here. 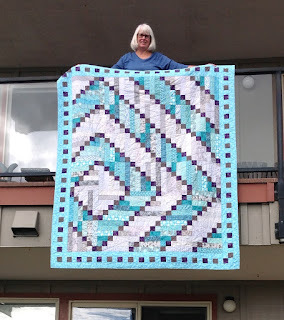 I made a Stacked Blocks Quilt of Valor. It's really scrappy - just up my alley! But at the same time, looks very modern! I don't always still to RW&B for QOVs. It's no required, but usually they are RW&B. 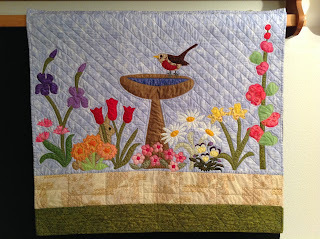 But I think an interesting to look at quilt is welcome any time. Read more here. 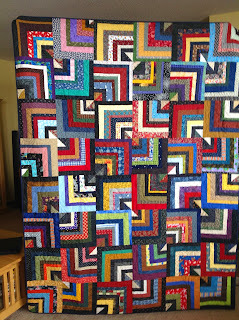 We had a RW&B raffle quilt last year. When a friend and I were selling chances on it at the Town Home Show. A veteran let us know, in no uncertain terms, that just because he was a veteran did NOT mean that he was attracted to RW&B. Let's just say, we were well-educated women on that subject! 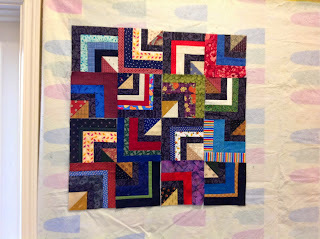 And it gives me the chance to make scrap quilts! I love that. The Newport Guild is uber-organized. The BOM one year, well - N organized it within an inch of government control! We had to sign a contract that we would display it at our show during the next 3 years. Boy, 3 years can just whiz by!! It's a lovely quilt, but I was done with it. So I took the flowers and put them in the garden. Notice the bunny hiding in the flowers!! More here. 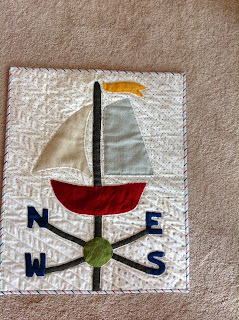 There was a wedding quilt to make for a Great-Nephew. It's an online pattern and it worked up wonderfully! I recommend it! Get the information here. My favorites were the Halloween quilts - not started until late September - but I loved them and so did the 4 grandkids!! Read about them here and here. There were PJ pants; fabric post cards; cuddle blankies ... and lets not forget - an Alaskan Cruise! A short series of books by Jack McDevitt - Ancient Shores and Eternity Road, and Moonfall. This author (from the past) writes the BEST sci-fi! Not about the technology, but personalities. I haven't read any that I didn't love. Finders Keepers by Stephen King I love how King weaves his other stories into this books! Makes me smile every time. The Martian by Andy Weir And you thought the movie was good ... the book is even better! Which books did you love last year?? I'm going to have to start keeping track of movies!! Here are some I remember loving! Well - that does it!! Let the new year ring out! May your coming year be filled with magic and dreams and good madness, I hope you read some fine books and kiss someone who thinks you're wonderful, and don't forget to make some art - write or draw or build or sing or live as only you can. And I hope, somewhere in the next year, you surprise yourself. I love seeing the review and all of your projects in one post. I don't count the Books I read or Movies I watch. That list would be way toooo long. Happy 43 Years a little late. SF looks so interesting. I've only been there on the MAX from the Airport. Happy New Year! What project is on deck? ?